"The Sydney 2009 World Masters Games"
The World Masters Games is an international multi-sport event held every four year. Between the 10 to the 18 October in 2009 they were held in Sydney Australia. These were the seventh edition of what has developed into the world's largest multi-sport event in terms of participation, with competitors ranging in age from 25 to 101 years . In Sydney 2009 World Masters Games included competitors from more than 100 countries who competed in 28 sports. 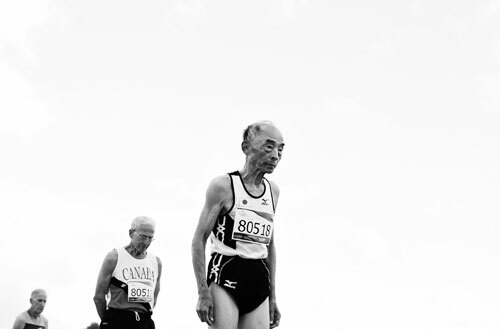 Competitors take their place at the starting blocks for the mens over 80's, 200 m race during the Sydney 2009 World Masters Games at the Sydney Olympic Park Athletic Centre on October 18, 2009 in Sydney, Australia.